For the second instalment in the Lethbridge-Stewart interview range we are pleased to visit with Welsh comic-artist Simon Williams, who provides the art for the cover of the first Lethbridge-Stewart novel, The Forgotten Son. Welcome, Simon. Before we get to your involvement with The Forgotten Son let’s take a quick look at your background with art and comics. What was the first comic you ever read? Thanks, Chris. The first comic I can remember reading was Might World of Marvel issue #231, waaaaayyyyyy back in 1977! It was a UK Marvel weekly, reprinting various US titles. 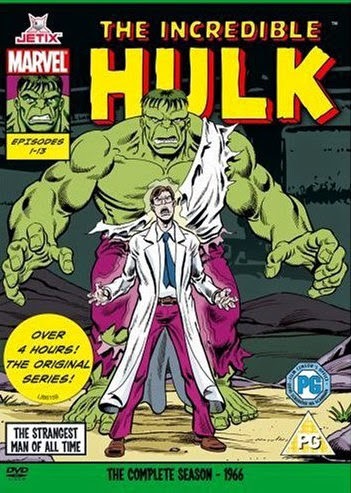 This issue featured among others, a reprint of the US Incredible Hulk #198… written by Len Wein, with artwork by Sal Buscema and Joe Staton. With that issue, I became a life-long fan of the Incredible Hulk, and it was Sal's artwork that inspired me to want to draw comics. Two fun facts about this issue… The back-up strip was a reprint of Marvel US's Planet of the Apes magazine, and the UK editor at the time was Neil Tennant (of Pet Shop Boys fame)! How much influence did reading comics and seeing their artwork have on your development as an artist? I can't put into words the influence those comics had on me. Not only as an artist, but my life as a whole. I learned to read with comics, especially Marvel. All I've ever wanted to do was draw comics. You count artists such as Sal and John Buscema, John Romita Sr and John Byrne as being some of your major inspirations. What is it about their art that you found appealing and how has their style inspired yours? Well, Sal's artwork was the first to stand out for me. With the Hulk being my favourite character, and Sal being the artist on the book for over one hundred issues, I read more of his work than anyone else’s. At the time I started reading comics, you had Sal on Hulk, Marvel UK were reprinting John Romita Spider-Man stories, John Buscema on Conan and The Fantastic Four… and John Byrne's run on Uncanny X-Men. To me, the Buscemas, Romita and, of course, Jack Kirby were the masters and innovators of the classic Marvel style. Brilliant draftsmen who could not only draw, but were master storytellers as well. John Byrne was one of the first of the new wave of ‘hot’ artists (along with the likes of Frank Miller) to follow in their footsteps, who carried on that tradition of classic storytelling and art, while maintaining modern sensibilities. And in a few words how do you describe your personal artistic style? You have said that you broke into comics thanks to Panini editor Alan O’Keefe, who contacted you in 2003 after noticing your art portfolio online. First, tell us a little bit about that portfolio. What were some of the art subjects and do you have any particular favourite pieces from that collection? I can remember that there were several Hulk pieces on there… as well as several pages from my original Discotronic Funk Commandos strip, which I created back in 1996. I do tend to cringe when looking at my old work (especially stuff that I drew nearly 15 years ago! ), but those early DFC pages feature some work that I still feel holds up to this day. 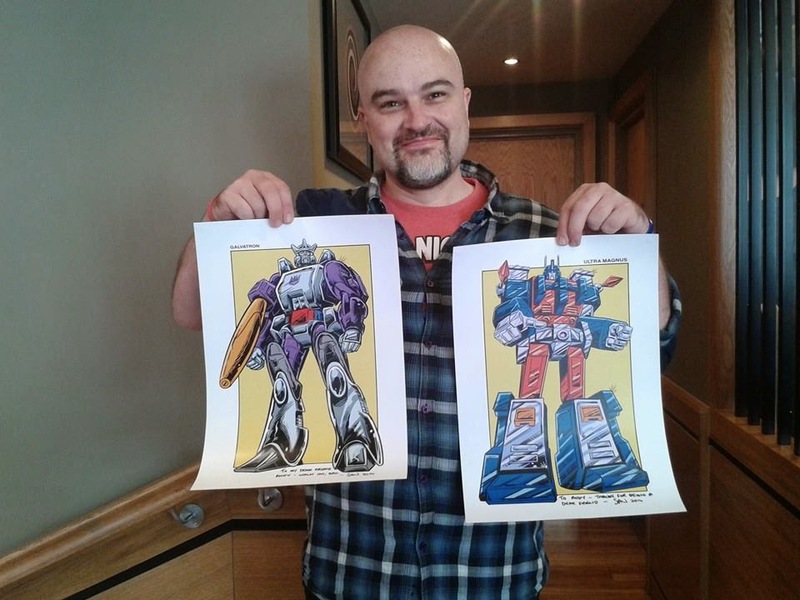 Now, once Alan O’Keefe noticed your work he offered you a chance to draw for the then-new Transformers: Armada title. You later contributed art to titles such as Action Man, Spectacular Spider-Man and Marvel Heroes. Looking back on your entry and first years as a comic artist, what do you feel are the most valuable experiences or lessons you learned as an artist? Well, the first thing I have to say is how grateful I am to Alan and the Panini guys for giving me my start as a professional in comics. Working with editors Ed Hammond, Brady Webb, Tom O'Malley and Rob Jones was an absolute joy. In my first year, I got to achieve two of my life-long ambitions: to draw the Incredible Hulk… and to draw a Hulk vs Thing battle (with Spider-Man thrown into the mix)! As for what I've learnt from back then; I'd say as an artist that you never stop learning. I still learn something new to this day. In 2009 you generated a lot of fan and professional excitement by drawing and posting online a comic series that featured a showdown between the Hulk and Death’s Head, a robotic bounty hunter – or as he calls himself, ‘a freelance peace-keeping agent’ – first created in Marvel UK’s Transformers comic in 1987. Tell us a little about that artistic experience and also your thoughts on why the project attracted so much positive attention. That project started out just for fun. I have always loved the character of Death's Head, and always hoped to see him fight the Hulk back in the old Marvel UK days (after all, he met and fought the Transformers, the Fantastic Four, Iron Man and even the Doctor!). So I decided to draw up some pages to post on my deviantArt page, again just for fun! However, people really started to take an interest in this strip, so I decided to finish it as part of my convention exclusive Soulman Inc Sketch Book. I never dreamt that it would actually lead to the real thing, where Marvel Heroes editor Ed Hammond told me that they were going to do a Hulk/Death's Head strip, with me on artwork and Death's Head creator Simon Furman writing! It was genuinely a dream come true. In recent years you created the comic title Retro Tales – Discotronic Funk Commandos for the Retro Comics Group. Tell us a little about the vision of Retro Comics and this superhero team’s place in your own comic book world. Retro Tales is my love-letter to ‘70s Marvel Comics. 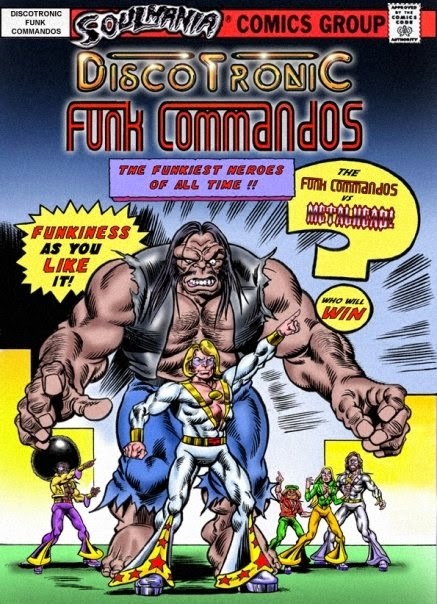 I created the Discotronic Funk Commandos back in 1996 (although back then they were called the Funktastic Four). I always had this crazy idea about superheroes and villains based of ‘70s disco musicians/bands. It's a comedy strip, but played straight (much akin to the classic Batman TV series starring Adam West and Burt Ward). My style of artwork has always been compared to the ‘70s/’80s style Marvel comics, so I decided to use the Funk Commandos as the main characters of Retro Tales, written and drawn in a retro comic-book style. Last year Retro Comics debuted two new characters, The Hoff and Thor, the Rock Warrior. 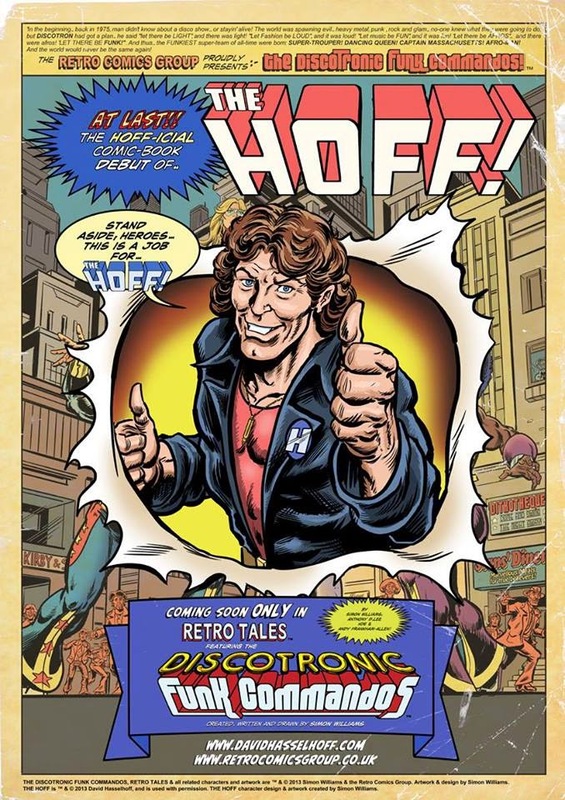 Both creations are based on two real-life pop culture icons: American actor David Hasselhoff and Canadian heavy metal frontman Jon Mikl Thor, respectively. How did their involvement into your comic title come about, and how has it been for you as a comic creator and artist working with these two men in translating their real-life personalities into the comic book world? Working with both Jon and David has been an absolute dream come true! I'm a huge fan of the band Thor (and often draw listening to their music! ), and have been a long-time fan of the Hoff. My collaborations with both started by correspondence online, and since have met David several times. I'm hoping to meet Jon sometime this year, as I believe he will be in the UK promoting his new bio-pic I Am Thor. Let’s return briefly to Death’s Head. 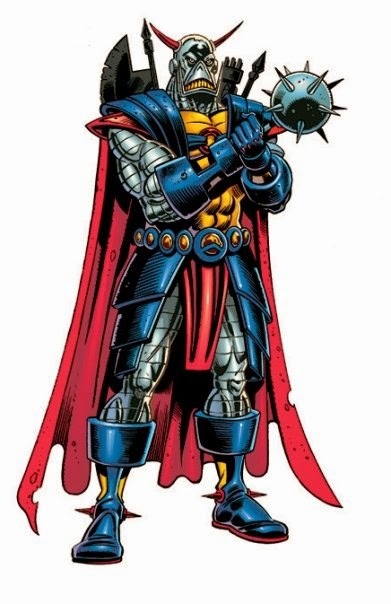 It is little-known in Marvel Comics lore that Death’s Head has a comic connection with a certain Time Lord known as the Doctor, a fact which you have mentioned in previous interviews. Growing up, were you ever a fan of Doctor Who, and if so, did you ever watch the 1970s stories featuring UNIT and Brigadier Lethbridge-Stewart? I certainly did! Doctor Who is a definite favourite of mine. Tom Baker being the Doctor I grew up with. Now, thanks to the DVDs and television repeats, I have seen most of the UNIT episodes featuring Jon Pertwee, and of course the wonderful Nicholas Courtney, whose character of the Brigadier is one of my absolute favourites! 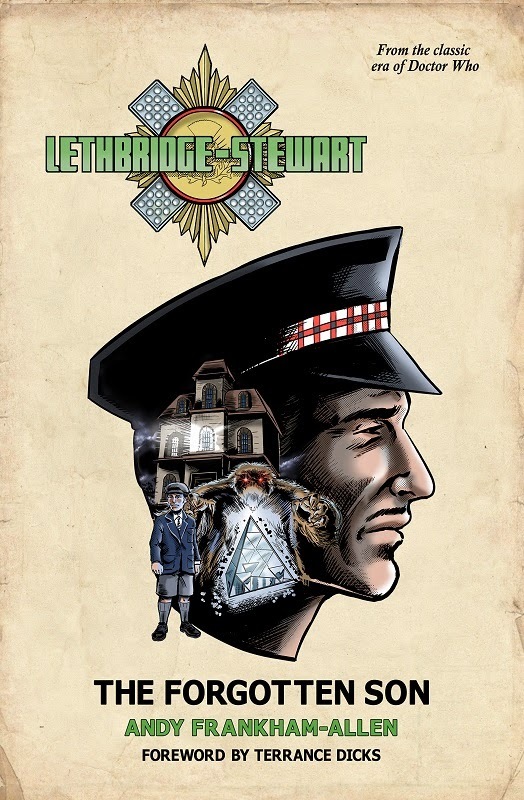 You are the cover artist for The Forgotten Son, which is the first instalment in the upcoming Lethbridge-Stewart novel series published by Candy Jar Books. How did you first become involved in this project? Is it your first time drawing cover art for stories as opposed to comic book story art? I was approached for the project by range editor and Forgotten Son author Andy Frankham-Allen, who is a very good friend of mine. I have always wanted to draw something related to Doctor Who professionally, and when I heard it was the Brigadier I was over the moon! This is my first time drawing covers for a novel, but I couldn't think of anything better to start with! Although The Forgotten Son won’t be available until 22 February your art for the book is already viewable online. In the image we see the profile of Colonel Lethbridge-Stewart, a young boy in somber clothes, an ominous house and a Yeti hovering over a glowing pyramid. Without giving away any details of the actual story, what can you tell us about your design for this cover and what helped to inspire you in its drawing? The design of the cover was something I discussed with Andy Frankham-Allen, and Candy Jar publisher Shaun Russell. I told them to give me the specific elements that they wanted me to incorporate onto the cover, and of course what style they would like. I was pretty adamant though about the Brig being prominent on the cover; something both Andy and Shaun were in full agreement with! Finally, and again without giving too much away, will this be your only cover for this book range or can we except more of your art covering the world of Lethbridge-Stewart? As it stands right now, I'll be doing more covers for this series! I'm awaiting more news from Mr Frankham-Allen on this, but I should be starting on the next one very soon!